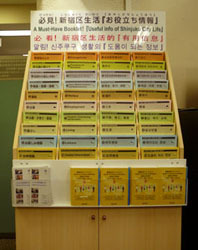 Information on Everyday Living for Foreign Residents of Shinjuku City is divided into 8 categories and contains useful information for foreign residents living in Shinjuku, such as on child raising, welfare, work, what to do in a disaster, and other helpful information. Because it is available free of charge, please take advantage of this publication. Living Information, which is available online, has been updated. It contains information on various matters, such as taxes, medical treatment, health insurance, and preparing for disasters. Click here for Living Information.